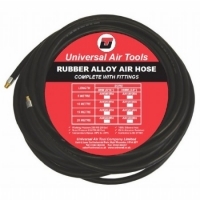 High quality 10mm (3/8″) bore rubber alloy air hose in lengths of 5m, 10m, 15m or 20m. Comes complete with 1/4″ BSP male threaded fittings. Conforms to BS 5118/2.